The best advice I've heard all week? Learn to fail fast. A couple of weeks ago, in this blog I was wrestling with the question of whether my idea for a green investing platform was a failure or not. After a few conversations with advisory board members and investors, I realized that I need to give myself permission to declare this idea a failure -- for now -- and move on. Why? Everyone I talked to says the investing climate is the worst they've ever seen. Deals are taking longer, money is staying on the sidelines, and valuations are completely out of whack. As I understand it, deals that took two months are now taking six or nine, while many investors play a waiting game. This just exacerbates the slowing rate at which deals can get done and makes it difficult for entrepreneurs to close deals. And for an idea like mine, which is really still in its infancy, the current climate makes it nearly impossible to get the jump start it needs. Then I came across Brad Feld's post of a couple of nights ago, on Mark Pincus and the concept of failing fast. If you haven't read this piece or watched Pincus's interview on Vator.tv, do yourself a favor and go do so now. It doesn't matter whether you are working on a start-up, a business unit in a big company, a social enterprise, or developing a product, the advice is golden: learn to fail fast and learn from the experience. I'll be back with another idea and will be, as Feld says in his post, "super-extraordinary-amazingly hungry for a success." Philly Mayor Michael A. Nutter and the Mayor’s Office of Sustainability today announced Greenworks Philadelphia, an ambitious, comprehensive framework to make Philadelphia the greenest city in the United States of America by 2015. It sets goals in five areas — energy, environment, equity, economy and engagement — and encompasses more than 150 initiatives. Together, they will reduce the city’s vulnerability to rising energy prices, limit its environmental footprint, and reposition its workforce and job development strategies to build upon Philadelphia’s competitive advantages in the emerging green economy. "Greenworks Philadelphia is a vision for how Philadelphia can and should seize this moment, building on the assets of the city left to us by the past and creating a better future for ourselves, our children and generations to come," said Mayor Nutter. Greenworks Philadelphia seeks to make more homes and buildings weather-tight, increase recycling and minimize trash, give residents better access to parks and fresh food, and capture the benefits of solar and geothermal energy. It envisions planting thousands of trees, equipping the municipal fleet with less-polluting engines and expanding green job training, so plenty of Philadelphia’s workers have the skills to retrofit buildings and install solar arrays. For more info: www.phila.gov/green/mos.html or www.greenworksphila.org or a full copy of the report. We burn coal. We can't ignore it. It's a plentiful resource and fuels the cheap electricity we use everyday. Like it or not, that's the way it is. Don't get me wrong, I hate things like mountaintop removal and the dangers coal-miners have to face every day. But I'm a realist and I don't believe we're going to be able to transition fast enough to alternatives to completely eliminate coal from our energy diet. My pal Gregor MacDonald had a stimulating post on Earth Day that generated some lively dialogue on the subject in which he argued that it's hard to win a fight against a cheap BTU. Gregor is smarter than I am on this subject, so you should definitely check out his blog: Gregor.us. Readers of the green skeptic know that I think there is a need for some serious R&D into Carbon Capture and Storage (CCS) and that we need to figure out whether we can really make coal clean. As I wrote in my comment on Gregor's post: I know this isn't a popular view, but coal is still so cheap and plentiful that it's hard to ignore. Of course, there are those who say it can't be done and others who say we'll hit peak coal before getting the technology right. If we do nothing, however, and others continue to ramp up coal production in its dirtiest form, where will we be? The World Business Council for Sustainable Development (WBCSD) announced the results of a study that shows how energy use in buildings can be cut by 60 percent by 2050, but noted that it will require immediate action to transform the building sector. The four-year, $15 million research project released its report today in Paris at the Alliance to Save Energy’s EE Global Forum and Exposition. Transforming the Market: Energy Efficiency in Buildings, as the report is known, uses new modeling techniques and provides a roadmap to transform the building sector. "Energy efficiency is fast becoming one of the defining issues of our times, and buildings are that issue's 'elephant in the room'," said Björn Stigson, president of the WBCSD, in a press release. "Buildings use more energy than any other sector and as such are a major contributor to climate change." According to the WBCSD, the "project took a bottom-up, market-driven approach to understanding the barriers to lower energy use, based on the most detailed view ever of the current state of energy demand in buildings. Energy use by building type was analyzed for millions of existing and new buildings and projected out to 2050, accounting for differences such as climate and building design." Researchers used computer simulations to show the market response to various financial, technical, behavioral, and policy options, identifying the optimum mix to achieve transformation for each market studied, according to WBCSD. Strengthen building codes and energy labeling for increased transparency. Use subsidies and price signals to create incentives for energy-efficient investments. Encourage integrated design approaches and innovations. Develop and use advanced technology to enable energy-saving behavior. Develop workforce capacity for energy saving. "The Smart Grid is the iPod of the energy industry," Audrey Zibelman, CEO of Viridity Energy, said last week. Getting a sophisticated, two-way communication system that matches knowledge with efficiency, and maybe even gets better information into the hands of energy consumers is a critical step in ensuring we have reliable power to meet increasing demand. Now the U.S. Department of Energy (DOE) is getting into the act, the American Recovery and Reinvestment Act, to be precise, as they announce plans to distribute more than $3.3 billion in so called smart-grid technology development grants and an additional $615 million for smart grid storage, monitoring and technology viability. Read the Full Story: DOE & Smart Grid. Business Week is featuring 25 of America's Most Promising Social Entrepreneurs and asking readers to view a slide show and vote "for the business you feel holds the most promise, from now until Apr. 26." They will announce the top five vote-getters on May 2. "Social entrepreneurs—enterprising individuals who apply business practices to solving societal problems such as pollution, poor nutrition, and poverty—are now 30,000 strong and growing, according to B Lab, a nonprofit organization that certifies these purpose-driven companies. Together, they represent some $40 billion in revenue. "Not surprising, then, that they've caught the attention of venture capitalists such as those at Acumen Fund, a nonprofit that invests in companies that try to alleviate poverty, and Bay Area Equity Fund, which backs businesses aiming to make social or environmental improvements to San Francisco's needier neighborhoods. President Obama has even suggested starting a new government agency to help socially conscious startups gain more access to venture capital." Go watch the slide show of these very inspiring people and their ideas. You won't be disappointed. 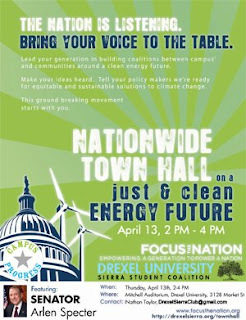 Today, I'm speaking at Drexel's Town Hall on a Just and Clean Energy Future, part of Focus the Nation's Nationwide series of Town Hall meetings. I'll be part of a panel on the Clean Energy Economy, with Audrey Zibelman, Viridity, LLC, Jason Brady of the Blue Green Alliance, and Kate Houstoun of Sustainable Business Network of Greater Philadelphia. Pennsylvania Senator Arlen Specter is scheduled to lead the a Town Hall style discussion before my panel. I will be interested to hear his remarks and hope the focus is on energy efficiency, innovation, and private sector investments to jump start the new green economy. Will try to update with a post tonight. Robert Galvin knows a thing or two about technology revolutions. As founder and CEO of Motorola, Galvin helped transform the telecommunications industry. The cell phone was developed while he led Motorola and went up against a deeply entrenched and government regulated monopoly. Galvin foresees a similar opportunity – and similar challenges – with the electricity revolution. Just as the decentralized cell phone was a threat to hard-wired phone companies, decentralized energy is a similar threat to centralized power. In Perfect Power: How the Microgrid Revolution Will Unleash Cleaner, Greener, and More Abundant Energy, Galvin and co-author Kurt Yeager, from power-industry think-tank the Electric Power Research Institute, offer their view on the coming energy revolution. The revolution will not be postponed, Galvin and Yeager conclude, because today's consumers and their devices demand it. But what's needed is for electricity to be viewed, as Edison originally envisioned it, "as the enabling vehicle for innovative consumer products and services, not as just another form of commodity energy." Galvin and Yeager's answer is a new, revitalized smart microgrid system to replace the outmoded centralized system based on technologies developed prior to the 1950s. Galvin and Yeager call for investment in a transformative infrastructure and loosening of rules and regulations that inhibit decentralized, entrepreneurial responses to increasing energy needs. One such bureaucratic barrier to distributed generation and decentralized microgrids, according to Galvin and Yeager, is that "only public utilities or governments [can] run wires that cross a public street or even to power remote villages." While we've seen challenges to this status quo from energy entrepreneurs around the world, such as Fabio Rosa in Brazil, I wonder whether a certain amount of regulation is appropriate here in the US. I'm not sure I want my neighbor tapping into the electrical wires running down our street, potentially putting the whole system at risk. But a well-trained, certified group of service providers might be a different story. Indeed, this is what the authors call for, envisioning "the emergence and growth of local service businesses, not unlike plumbing, heating, and electronic specialists, that install, maintain, and fine-tune the perfect power system to the highest quality standards, while dramatically cutting costs for all consumers." Increasing energy demand in the US and around the world – almost one-third of the world's population is currently without electricity and that number is expected to double by mid-century – will force the hand, much like consumer demand for cell phones transformed the way we communicate. Galvin and Yeager see an abundance of opportunity in the problem of upwardly spiraling demand and need, but not from government prescriptions and regulations, despite recent developments in the US. "The key to change is free enterprise," the authors conclude. "This means no barriers to entry, the availability of clear and accurate price signals, an absence of subsidies, and the elimination of predatory practices." In fact, the revolution has already begun. As the authors suggest, "Consumers, communities, and utilities alike are being confronted with a 'perfect storm' of converging cost, quality, and environmental issues that urgently require the smart, entrepreneurial transformation of our obsolete electricity infrastructure and its state-regulated monopoly, retail service business model." The book struggles between being a manifesto for a new energy model and investment advice manual. The lists of companies and institutions at the end of each chapter seem tangential and superfluous. I would have cut the book by 100 pages or more, making it the perfect size for a cross country flight. As it is, I'm not sure the audience for this book will wade through the authors' enthusiasm for their "perfect" model and promotional language associated with Galvin's Electricity Institute to find the kernels of good information about the coming energy revolution. "I know your blog, I follow you on Twitter, and you're speaking at this conference," a number of people said to me in Aspen last week. "But what do you do?" It's a question that comes up a lot these days. The answer is I'm doing a lot of things, wearing a lot of hats. (And trying to find one that fits.) I've learned to be nimble over the past six months. Six months ago, I left Ashoka to develop my idea for a green energy investing platform. Needless to say, it's been a wild ride. I wrote about it on my second day on the job, when Career-man was at war with Entrepreneur-man within. I rode a roller coaster through those early days and, more often than not, Entrepreneur-man ruled the day. Then September devolved into October, and November was fast on its heals. The credit crisis, collapsing financial markets, and freezing up of capital flows all combined to make it quickly apparent that my timing was off. Luckily, I was too small to fail, to borrow my pal Howard Lindzon's phrase. I hadn't taken anybody's money and didn't have any employees to lay-off. I started consulting more and began retooling my idea to adapt to the market realities. "Life is what happens to you while you're busy making other plans," sang John Lennon in one of the last songs he recorded before his untimely death. Am I wiser for this experience? It's too soon to tell. Too soon to tell if it is a failure. Is an idea a failure if it doesn't evolve beyond the idea stage? Or is it still just an idea? I do know a lot more now about what it feels like to put yourself out there and try to prove an idea. Of course, my idea isn't dead. Indeed, I had more interest in it last week than I've had in 3-4 months. So much so that I started dusting off the PowerPoint slides and the rudimentary business plan. Rather, the idea is in a holding pattern while life happens. So, I haven't given up the dream. My entrepreneurial dream is still alive, and I get more excited and animated about it when I talk to people about it. Even last night, talking about it with a stranger, an investment banker, in my neighborhood bar: I got excited about it, and he could see the value, had a couple of ideas about people to whom I should talk. Why am I telling you all this? I've learned it pays to be forthright. So, consider this a six-month gut-check. No one could have foreseen where we'd be right now, either in the markets or in our enterprises. We have a long way to go, but being nimble, wisely paying attention to signals, and being forthright may help us along the journey. Obama Tells G20: "I'm Putting a Gag Order on Greenhouse Gases"
LONDON, April 1 - US President Barack Obama today told the leaders of the G20 that he was "putting a gag order on greenhouse gas emissions" and that the US was going to start at home, with Congress and members of his own Administration. "Today I have imposed a gag order on the most harmful greenhouse gas polluters in the United States," President Obama told the group of leaders gathered in London. "I have put a gag order on certain members of Congress and on members of my own Administration." In an unusual move, the President revealed details of his plan, which many are calling the "Greenhouse Gag-order," specifically referencing some of the most wasteful CO2 polluters in Washington. "I have put Representative Barney Frank on notice," Mr. Obama told an enthralled crowd. "Look, it's as simple as this: If he opens his mouth again, he will have to pay a hefty fine." In addition to Congressman Frank, Chairman of the Financial Services Committee, Mr. Obama named Timothy Geithner in his gag order, suggesting that his Treasury Secretary will only be allowed to speak during the work week. This move may be designed to help curtail the Secretary's long-winded explanations on weekend television news media, which have only exacerbated the financial picture. "Look, we have to do something about the windbags in Washington," Mr. Obama said. "It is my hope that the Secretary and Mr. Frank will be leaders in putting a cap on the greenhouse gas emissions in our own hallowed halls." Mr. Obama went on to say that he hoped others in Washington would follow suit, and that he was considering a voluntary carbon credit option to be implemented as early as this summer. Secretary Geithner, when asked for comment on the President's plan, said, "This is consistent with the Administration's plans to tax wealthy individuals across the board. We feel a carbon cap on loquacious individuals is totally within our reach." A person close to the Office of the President indicated the Administration was considering similar sanctions on vociferous celebrities, such as Rush Limbaugh, Oprah Winfrey, and Robert Scoble. Calls made to Rep. Frank's office for comment went unanswered. President Obama wants to help fight climate change by capping emissions of greenhouse gases such as carbon dioxide, or CO2, from big industries -- and now individuals -- and allowing them to trade rights to pollute. Such systems are commonly called "cap and trade."